The first meeting of the Careers Development Section was aimed at researchers looking to become principal investigators. 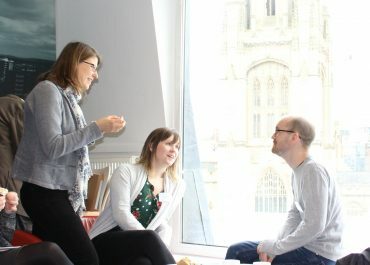 Hosted by the University of Bristol and kindly supported by the Biostatistics theme of the NIHR Bristol Biomedical Research Centre, this free event was attended by 50 statisticians. Professors Richard Emsley (King’s College London) and Steven Julious (University of Sheffield) shared their experiences as principal investigators. The two talks highlighted how, as statisticians, we have numerous opportunities to lead grants applications. Richard shared his successes and challenges when applying for methodology grants. Steven discussed his experience of leading a clinical trial (PLEASANT). While their careers have taken different paths they both have extensive experience of being principal investigators and it was great to hear their advice and tips! The NIHR provide excellent opportunities for statisticians to be principal investigators on their own personal training fellowships. Peter Thompson from the NIHR Training Coordinating Centre talked about changes to the NIHR fellowship funding schemes. The new NIHR Academy will simplify their fellowships presenting a great opportunity for outstanding individuals to gain training and support and lead their own project. We look forward to the announcement of their full plans later this year. Professor Tim Peters (University of Bristol) gave us his insights as a funding panel member of the MRC-NIHR Methodology Research Programme, another opportunity for statisticians to lead a grant. Tim highlighted that as statisticians we may be leading large components of a grant or jointly leading a grant. While this may not be seen as a principal investigator in a conventional way, we should not undersell these leadership roles and the experience we gain from them. Opportunities exist in methods research and applied research and it is important to be clear what we do in our roles as statisticians. Writing a grant can be a daunting process, requiring skills statisticians may have had little opportunity to develop. The afternoon sessions were designed to provide practical advice. The first session from Zoe Trinder-Widdess (NIHR CLAHRC West) highlighted the importance of writing in plain English in a grant application giving us some great tips to get us started. Earlier speakers stated that clarity of summary statements had a large influence on the chance of success in the application review process. This session provided practice in writing clear, concise summaries. Public involvement is a key part of many grant applications and knowing where to start can be challenging. Laura Flight (University of Sheffield) explained why public involvement is important and why statisticians should have public involvement in their grants; even those based on methods research. She shared her experience of including public involvement in her methods based NIHR doctoral research fellowship. Roy Powell (RDS South West) then extended the discussion highlighting other opportunities for statisticians to include public involvement in their research, giving hints and tips for success. The day provided attendees with first-hand accounts of how to be a principal investigator, along with practical advice for writing a successful grant application. We hope this first workshop was useful to our members and would like to encourage members to get in touch if they have ideas for future meetings. The next Careers Development Section event will be on “Demonstrating patient benefit in methodological research”. The slides from this event can be found here.